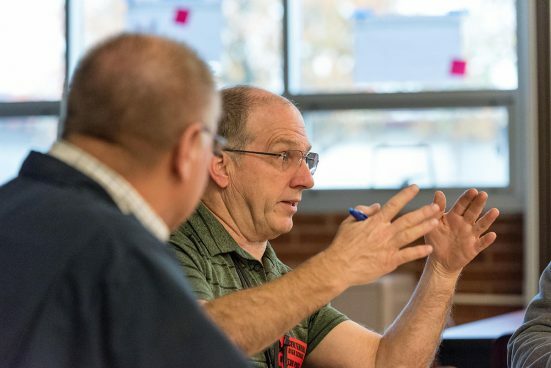 Tim Gutfleisch, a manufacturing instructor at Reynolds High School in Troutdale, participates in a meeting of several regional high schools working in partnership with All Hands Raised to strengthen pathways to careers in construction and manufacturing. All Hands Raised is playing a key role in helping Portland-area high school students traverse the chasm between graduation and work in high-paying manufacturing jobs. It’s no secret that trade classes have been in decline in public schools across the nation for the past 30 to 40 years. But in Oregon, new programs and partnerships with the K-12 system are working to bring trades back to the forefront. path to high-wage manufacturing and construction jobs, without the burden of college debt. But there’s a lot of work to do building interest and connecting industry with schools to make it happen, said Jeanie-Marie Price, a spokeswoman for All Hands Raised, a Portland nonprofit working on the problem. The organization for the past three years has been working with five local high schools: Reynolds in Troutdale, Centennial and Sam Barlow in Gresham, and Helensview and Roosevelt in Portland. Its goal is to build pathways to careers for students in construction and manufacturing, strengthen career-technical options and improve access and transitioning to post-secondary career training. The group doesn’t provide infrastructure funding or create classes directly. Rather it conducts analyses of each school and district, arranges partnerships and interactions with industry leaders and works with local manufacturing and construction companies to build pipelines to jobs. At Reynolds High School, the group’s efforts have led to a 20 percent uptick in student enrollment in trade classes, Price said. It also helped spur creation of the first HVAC program ever at a public high school in Oregon, said Justin Birmingham, administrator of grants and partnerships for the Reynolds School District. All Hands Raised did a data-driven analysis looking at the school district’s shortfalls, brought it to the school’s attention and helped encourage the administration to take action, Birmingham said. For students, the group also helped create field trips to industry sites and lectures by prominent business leaders and industry experts. Prior to All Hands Raised’ involvement, students would take an exploratory metals class in the first year, but most moved on to other things and didn’t go back to it, Birmingham said. “All Hands Raised helped us build structures that motivate students to stay consistent in one field of study,” he said. Students who complete a CTE three-course program also graduate at a 91 percent rate, which is far higher than the graduation rate at large, he said. The HVAC class, which is already at full enrollment, began this fall, said Tim Gutfleisch, the manufacturing instructor at Reynolds. To kick off the class, each student is building themselves a large toolbox. And if they finish the program — which will include three classes — they will get goodies that will help them compete in future careers. New trade classes and a pipeline for skilled trade workers is something industry is also eager to build, said Emi Donis, general counsel at Senior Aerospace SSP. Donis, who has has been working with All Hands Raised at Centennial High School, said school officials don’t often know who to reach out to when they want to build trade programs. One problem she encountered: high school students seeking occupations in the trades often don’t know how to apply. And even when they do, the application process designed by some employers isn’t made with them in mind. Donis worked with several Centennial students who were applying for jobs at Precision Castparts Corp. (PCC), where she previously worked as deputy general counsel. Even she struggled to navigate the online application for an entry-level position. The site, she said, was focused almost exclusively on white-collar college graduate workers, and not on the trade pipeline. PCC is aware of the issue and is working with All Hands Raised to improve access to its jobs. All Hands Raised is working with a few groups, including Work Systems, to try to develop a larger application system for students across Oregon. When it’s finished, the hope is that students will be able to put their resumes online and list jobs they’re interested in, and employers can look through it and hire them. Overall, creating a pathway for students to high wage jobs is good for both the economy and social mobility, Birmingham said. Many who complete their training in the trades and move through the journeyman program start at $30 an hour or more, without college debt, he said.